Our first day on the South Island! (Shep is still with his mom and girlfriend and will be until the eleventh, and took the ferry over a day before us). 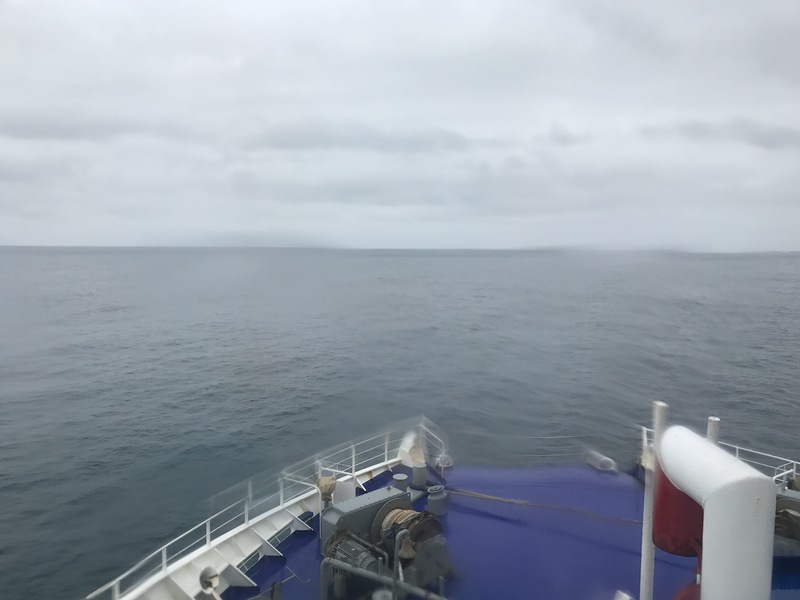 We started the day in Wellington, though, waking up in our room at 7, packing quickly in ten minutes, and making our way through the gloomy drizzle (in a taxi) to the ferry terminal. 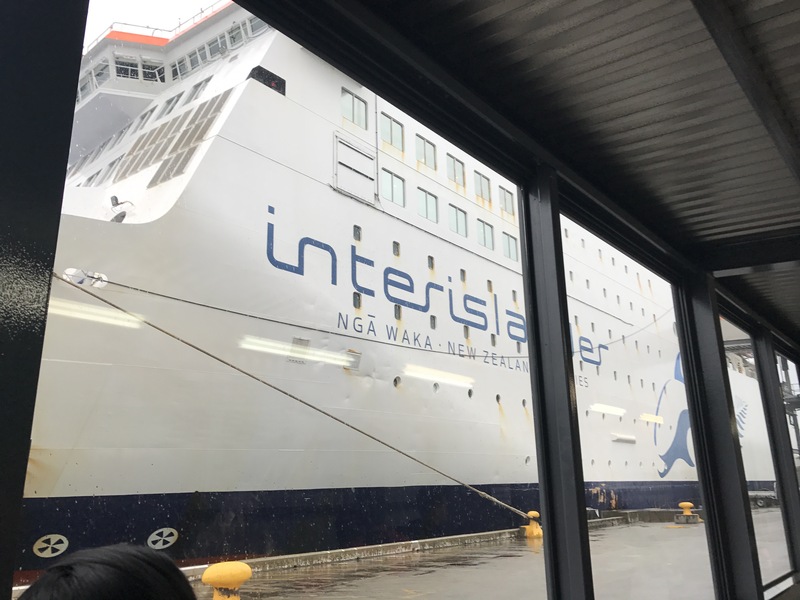 The Interislander ferry takes people and cars across the Cook Strait in about three hours, and it is massive. 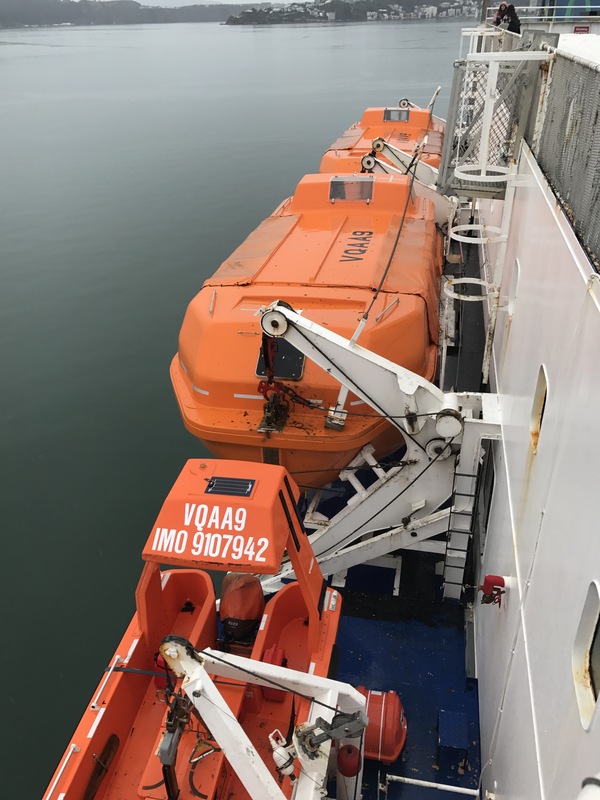 We waited in a line outside for a bit in order to check our bags airplane style, which surprised us in the moment but in hindsight makes sense, and then made our way a couple stories up the side of the boat to the pedestrian entrance. The inside was crowded and bustling and we found our way to some nice cushy reclining chairs with a port side view just before the boat left its dock. 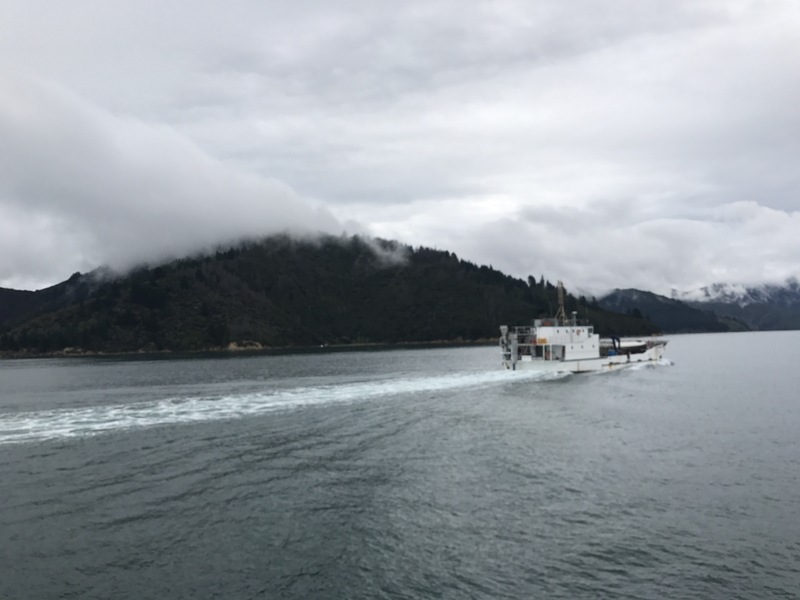 The ride itself was pretty lovely, on smooth seas and under overcast skies, and we took advantage of the time to look ahead at what awaited us (logistics as well as exciting natural beauty) on the South Island and do some napping. At the terminal in Picton we grabbed our bags from the again airporty baggage claim and headed downtown to the grocery store to supply ourselves for three days on the Queen Charlotte Track. At 1:30 the Beachcombers ‘mail ferry’ left to take us to Ship Cove, but along the way stopped at some houses only accessible by boat to deliver their mail. This ferry ride was where we started to see up close and personal the extraordinarily beautiful Marlborough Sounds, which are these arms of land (really the water in between the arms) extending North off the top of the island. 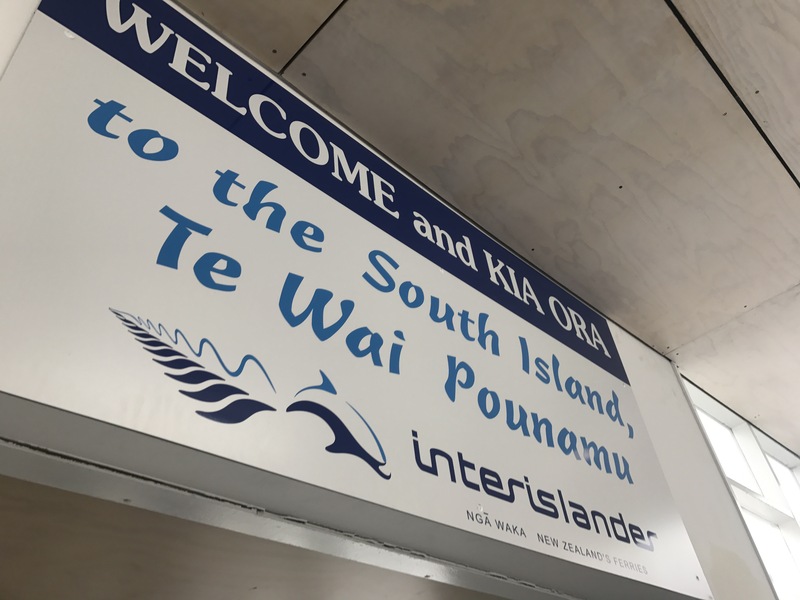 We learned that a Sound is an ancient river valley which becomes flooded by the sea level rising or the land descending down to sea level, whereas a Fiord is carved out by glaciers – so these sounds are true sounds whereas Milford Sound and its companions down south are technically Fiords. 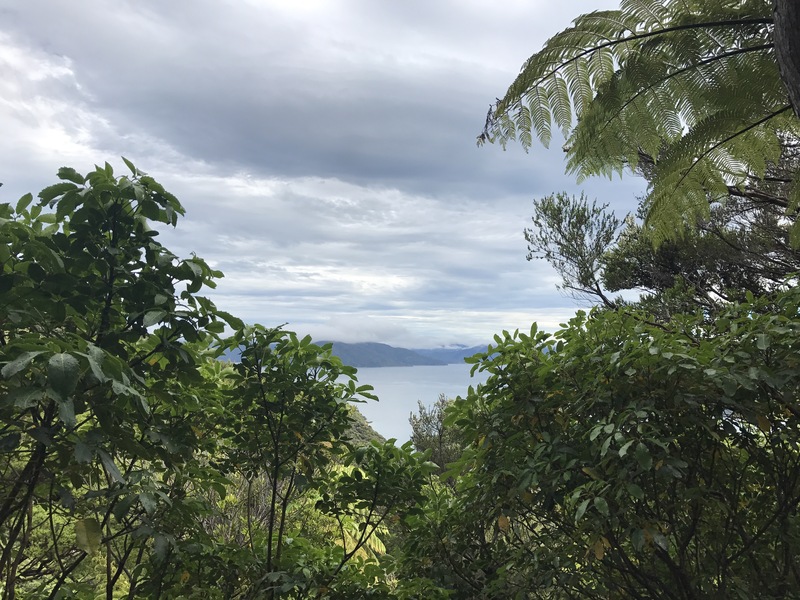 The Maori name for these Marlborough Sounds is Tōtaranui, because they are geographically reminiscent of a large (nui) Tōtara tree, if you consider the main channel the trunk and the sounds themselves the branches. At the landing at Ship Cove we tragically forgot to get a picture at or of the plaque designating the Northern terminus of the South Island section of the TA – to compound that, I discovered both that one of my hiking poles got stuck collapsed over four days of unuse, and that I had lost my pair of hiking socks. But not to wallow in the past’s tragedies we rebounded and pivoted our focus on enjoying the beauty and excitement of beginning the second Island. The track was right off the bat gorgeous, through untouched old growth and with spectacular views (usually, when it’s not opaquely foggy) down and around the beaches and tropical blue water. 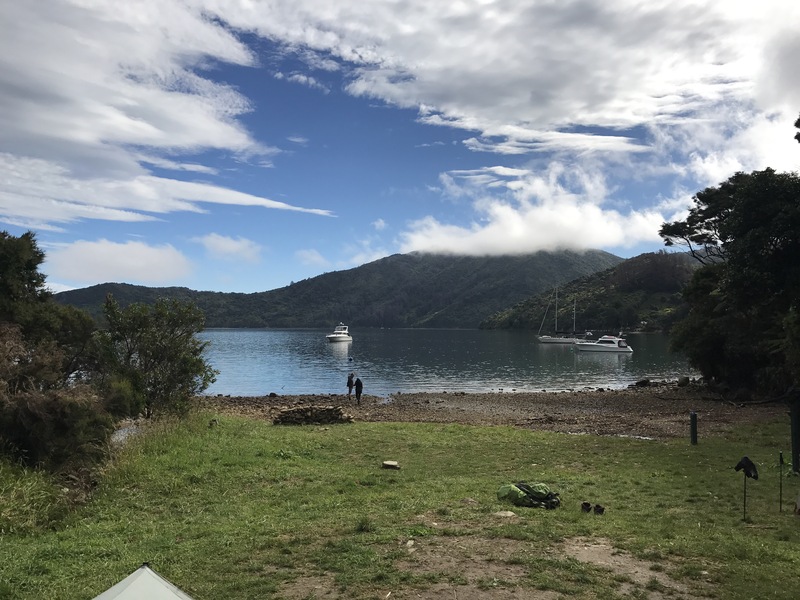 A short jaunt (4 km) to our campsite later, though, and the sun began to poke its head through the clouds and we rejoiced at the splendor of Schoolhouse Bay and Revelation Bay, ringed by low but sharp green hills and occupied by drifting picnicking sailboats. 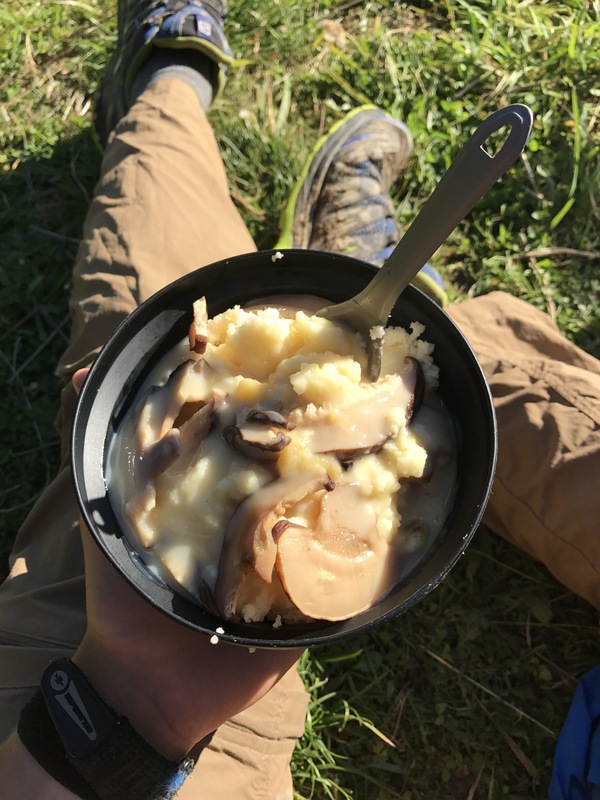 We set our tents up just up from the rock beach, on some flat grass, and cooked some cheesy couscous in the sun, happy to be on the trail again, and looking forward to what’s in store! It’s a pretty early night; the sun is setting and we are cozy in our bags listening to the murmur of a couple other hikers and the buzzing of the cicadas.